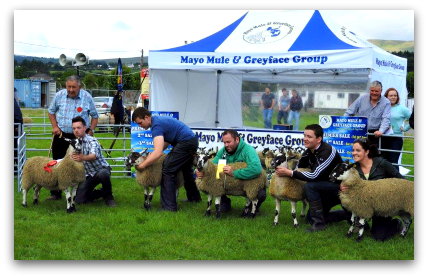 The Mayo Mule and Greyface group was established by a group of enthusiastic farmers in the South West of Mayo in 1984. The sale was small at first but with such demand for the good quality stock the sale grew year on year and today the Mayo Mule and Greyface group is hosting their 32nd annual sale. The group has a membership of 50 farmers producing 4,000 mule lambs & ewe hoggets each year. The quality of the stock is improving year on year with the same buyers returning annually. The group strives to produce Sheep of the highest standard. To ensure this, inspections were carried out in the early days of all stock. Both the Mayo Mules and the Greyfaces are tagged with a group tag ensuring that the breeds are true to type and meet the standards of the Mayo Mule and Greyface group.